Fairy Tales do exists in the modern world! Yes I admit, I am a fairy tale lover even though I was a kid! Therefore this newest fairy tale movie from Disney awakes the childhood in me! "Maleficent" for me is a modern fairy tale movie. It combines the recipe of the traditional fairy tale story we used to love and the modern action twist which excites our hi-tech minds. The movie reminded us of the "Sleeping Beauty" wherein the princess (Aurora) was cursed by Maleficent to sleep forever when she reached the age of 16 after her finger was tuck by a needle. Only true love by a prince will awaken the princess! But in the movie, they put a twist in this traditional story! Just like a well-love fairy tale, the movie teaches the viewers moral lessons. The story revolves around friendship, betrayal, revenge, forgiveness, and unity! Once more, the lead star Angelie Jolie didn't failed the expectations of viewers. She created another remarkable role. 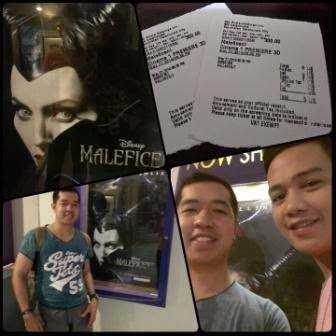 Her character as Maleficent, a hero and a villain (bida-kontrabida) at the same time is truly awesome! Perfect performance by an actress! I even appreciate her action skills!